HÀ NỘI — The car rental market has become very active in the capital city as the Tết (Lunar New Year) holiday approaches. A small survey by the Vietnam News Agency of rental car streets of Hà Nội showed the mid-range segment of passenger cars with four to seven seats is nearly completely sold out almost one month before Tết. If customers want to rent a car, they will have to commit to renting it for the entirety of the break, which lasts from February 2 to 10. On rental car streets including Trần Khát Chân, Thái Thịnh, Xã Đàn and Hoàng Mai, the shortage of cars and increasing demand have pushed prices up 20-30 per cent compared to normal rates, touching VNĐ7 million-VNĐ25 million (US$301-$1,075) per car, depending on the model. The difference in price between manual and automatic transmission cars ranges from VNĐ100,000 to VNĐ200,000 per day. Although rental prices have increased, there is not enough stock of popular models such as the Honda CR-V and Toyota Fortuner. Rather than raising prices, several rental companies have limited the number of kilometres each customer may drive. If a customer exceeds the limit, he or she will have to pay more money. Nguyễn Thanh Hương, Director of the Tourism and Transport Service Company Ltd, in Hai Bà Trưng District, said prices were up because of increased demand. “The customers are excited about seven-seat cars, which have seen rental prices increase by between VNĐ200,000 and VNĐ300,000 per day,” Hương said. Five-seat models such as the Morning AT, Huyndai i10, Vios AT, Kia Cerato AT, Mazda3 AT, Mazda CX 5 AT and Toyota Camry have rental prices from VNĐ800,000 to VNĐ1.4 million per day. Those with seven seats such as the Innova AT, Kia Sorento A and Fortuner AT are priced from VNĐ1.2 million to VNĐ1.4 million. 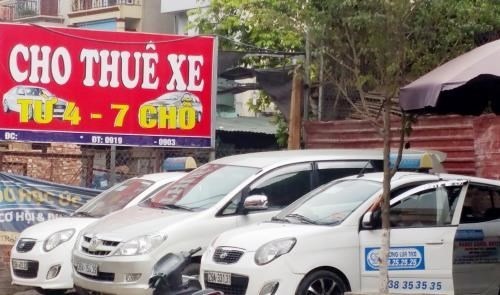 Hữu Cường, a resident of Huế Street, complained the rental price of small sedans like the Kia Morning and Hyundai i10 was usually the lowest, but it has nearly doubled to VNĐ1 million per day. Trần Đình Duy, an owner of a car rental company on Trần Khát Chân Street, said his company had 40 cars sized from four seats to 16. All small passenger cars had been ordered one month ago, and even all the large passenger cars – which were rented to travel to pagodas on the holiday – had been booked.